A properly retaining wall can tame a slope and protect the rest of your landscaping from sliding debris and excess water drainage. There are several things we take into account before beginning construction of your retaining wall. We must make sure your wall is sturdy enough to hold back the slope, built solidly to withstand the elements so as to last a very long time, and doesn’t violate any building codes. Sometimes a call to official utility workers is warranted to have them come out and check for buried power cables and sewage lines. 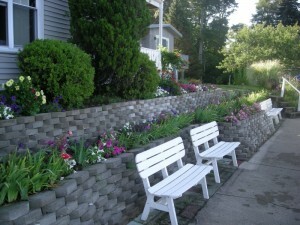 A quality wall can add a great deal of beauty and structure to your overall landscaping plan. A well-placed wall can also help define the space. 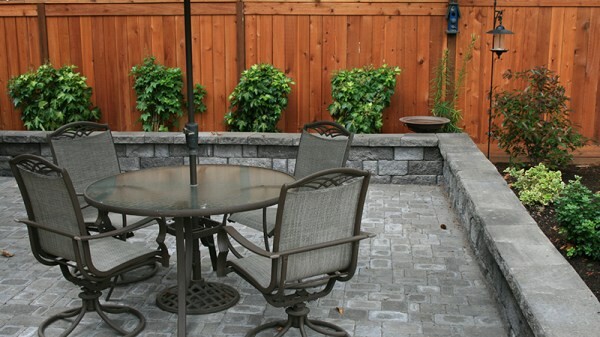 You may even consider integrating a patio into your wall design, a bench and/or stairs. This creates both functional and architectural interest. We use a variety of great looking materials like limestone, boulders, concrete sting and keystone blocks to build your wall. These materials add charm and create a unique decorative look. If you enjoy outdoor grilling your retaining wall can be put to good use. Consider building one that helps define an outdoor kitchen space. A barbecue grill, outdoor storage, and other accessories are then fit snugly into the wall. You may also use it to define the patio space your outdoor kitchen rests on. This creative use of a retaining wall creates the illusion of separation and helps to outline an outdoor eating, cooking, and dining area. 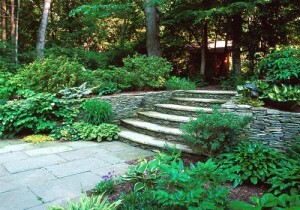 Retaining walls can also be built to create a two-tiered garden effect. This gives the illusion of a larger yard than you actually have. It can also help in terms of drainage and erosion control. Some interesting options to consider include integrating a garden pond into the wall design. The wall can be used to outline the perimeter of the pond. It can also be designed to contain shelving nooks, where low-maintenance plants like Tillandsia can live. 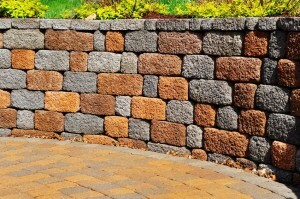 There are many types of retaining walls. These include freestanding, concrete, stacking, brick, wood, and flagstone. It’s important for us to access your individual needs and yard structure before determining what type of retaining wall we’d recommend for your particular installation. Are you planning on building a retaining wall soon or in the future? Are you concerned about the condition of an existing wall? Give us a call today! Let’s talk. 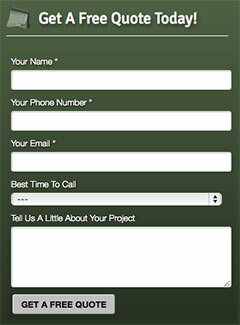 We’re more than happy to consult with you on your project as well as provide a free quote.